Fill-in-the-blank, bridal shower invitations feature a colorful illustration of a bride carrying a stack of gifts. 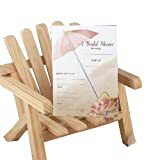 Pack of 25 cards, each 4-5/8 by 6-1/4-inch. Look for matching Thank You Notes. Your wedding deserves the best - and the best comes from Hortense B. Hewitt, the leader in quality wedding accessories for more than 60 years. Thank you cards feature a colorful illustration of a bride carrying stacks of gifts. Pack of 25 cards, each 4-7/8 by 3-1/2-inch. Also look for matching invitations. Your wedding deserves the best - and the best comes from Hortense B. Hewitt, the leader in quality wedding accessories for more than 60 years. A hand-written thank you is always the right choice and these note cards are the perfect place to share your appreciation. Bright white thank you cards feature a charming pink cherry blossom design. Package of 50. Your special event deserves the best - and the best comes from Hortense B. Hewitt, the leader in quality wedding accessories for more than 60 years. Make sure to invite HBH to your event. Delightful bridal shower invitations with fill-in-the-blank details and a beach umbrella design.